The award-winning Ferguson’s Career Guidance Center is a comprehensive resource for career exploration and planning that allows users to quickly find the valuable career information they need, whether it’s industry and professions articles, school planning resources, or skills and career advice. 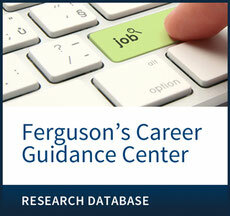 Known for its unprecedented depth of coverage, Ferguson’s Career Guidance Center is organized into three main sections: through Industries and Careers, users can explore a multitude of industries, career fields, and professions; Plan Your Education helps users find the schools that fit them best; and Launch Your Career offers solid advice to help users perfect the skills that beget success. The material draws from a range of authoritative sources, including more than 980 articles from the six-volume Encyclopedia of Careers and Vocational Guidance, 17th Edition. A “From Our Career Experts” section features regular blog posts with an archive of more than 2,000 posts. Industries and Careers: Ferguson’s Career Guidance Center covers 140 different industries and career fields and thousands of professions in areas such as agriculture, food, and natural resources; architecture and construction; arts, A/V technology, and communications; business, management, and administration; education and training; finance; government and public administration; health science; hospitality and tourism; human services; information technology; law, public safety, corrections, and security; manufacturing; marketing, sales, and service; science, technology, engineering, and mathematics; and transportation, distribution, and logistics. Plan Your Education: Ferguson’s Career Guidance Center can help students find the schools that are the best fit—choose from undergraduate, graduate, nursing, and vocational and tech schools in the U.S. and Canada, and narrow your list by location, tuition, enrollment, sports, areas of study, campus housing, and a variety of other characteristics. Launch Your Career: Ferguson’s Career Guidance Center offers solid advice on writing resumes and cover letters, interviewing skills, applying to apprenticeships and internships, professional etiquette, and other workplace skills. Users can download resumes and cover letters in Word and PDF formats to use as templates to build their own. A special section on networking features 12 articles, written by networking expert Miriam Salpeter, that discuss what networking is (and what it isn’t), how to identify and understand exactly who is in your network, how to manage your online presence and use social media in a job search, how to make cold calls and handle follow-up, how to maintain and manage your network even after you have a job, and more. Career Skills That Transcend Career Exploration: Ferguson’s Career Guidance Center’s advice and tips on interviewing, etiquette, and workplace skills can be applied to academic success strategies and general life skills. Career Advice Blog: Ferguson’s Career Guidance Center features regular new blog posts “From Our Career Experts,” with an archive of more than 2,000 posts on topics such as job searching, workplace issues, interviewing, networking, resumes and cover letters, and salary and benefits. Career Interest Assessment: Ferguson’s Career Guidance Center’s Career Interest Assessment quiz ranks users’ work interest areas and suggests related occupations and industries. Links to Outside Jobs and Internships: Find a job with Ferguson’s Career Guidance Center’s searchable, current, live job and internship postings. Videos: Ferguson’s Career Guidance Center has more than 350 tablet/mobile-friendly videos covering jobs, industries, and career development skills. Its “Career Q&A: Professional Advice and Insight” videos let users get a no-nonsense, insider’s perspective from working professionals across multiple industries, including actors, dentists, fashion designers, Internet security specialists, special education teachers, and more. Authoritative Source List: Ferguson’s Career Guidance Center features a complete inventory of the extraordinary amount of content in the database, including titles from Ferguson’s renowned Careers in Focus series and the Encyclopedia of Careers and Vocational Guidance, 17th ed.